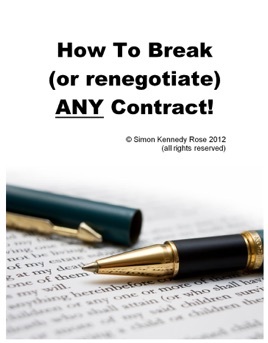 Half of author royalties for ‘How to Break (or renegotiate) ANY Contract’ are donated to ShelterBOX; an international provider of emergency shelter and life-saving supplies for families around the world - who through no fault of their own have lost everything in natural disasters, including their homes. Nearly all disputes are settled through negotiation, including over 90% of those in which legal action is initiated - that do not ultimately progress through a full hearing to end in a judgement. This book reveals what professional consultant negotiators successfully do for their clients, and how you can apply the same principles and processes to your own agreements and dealings, alleviating your 'contractual angst'. "I really enjoyed it, it is well written, easily digested and very engaging; a great read on the plane to negotiate a contract!" "Souvent mon travail m'a conduit a suivre les conseils de Simon et je n'ai jamais eut a le regretter. Simon est le positivisme meme"